Why Do We Sleep? How Much Sleep Do We Need? While pulling an “all-nighter” was a joy growing up, it is now the reason we can not function the next day. We tend to keep things till last minute and in its devilish effect makes us resort to spending one night doing everything and anything we should have been doing for weeks. Sleep is universal and conjuring all we know we still have a universe of information we do not understand. The paradox of how hard our body works while we feel as though we are not doing anything is not completely known. Simply, scientists do not know for sure. However as they look with a broad perspective they have learned that it is simply a time for the body and brain to recover. Our brains are stimulated at all times of the day, including vitaly when we have new experiences. Our brain depicts the most important connections throughout the brain and begin to strengthen them while the weaker connections are oppressed. Scientists have learned this from various experiments including test on sleep deprived mice where they had found this correlation. Obviously correlation does not dictate that those results hold true however it was confirmed that the percentage of chance was so slim that the results could be considered confirmed. Most of us know that 8 hours of sleep are important for our health but few of us know why those hours between the sheets are a priority. How much sleep is the right amount of sleep? This question never be answered in science. The truth is just like our bodies and lifestyle is different so will our sleep schedule. 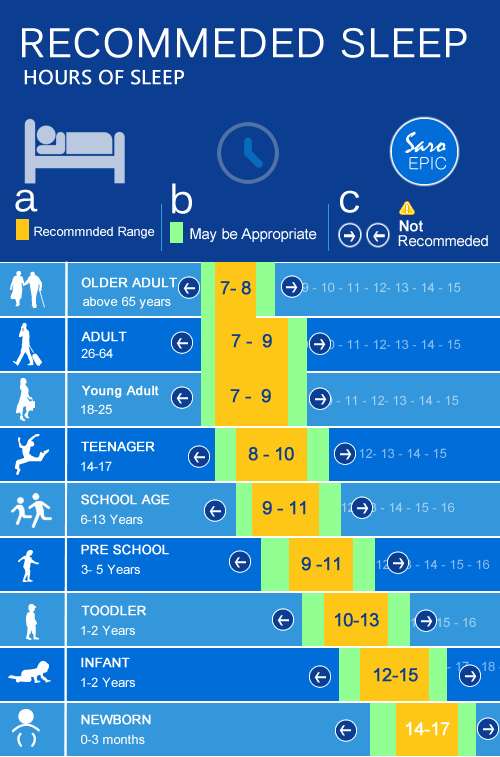 Scientists have confirmed a ‘sleep schedule spectrum’ that correlates age with not recommended amount of sleep, may be appropriate amount of sleep, and optimal amount of sleep. Now keep in mind that these numbers are very generalized and personally your effects of the optimal sleeping may be complete opposites of someone else’s. Can I change the amount of sleep I need? I have bad news. Obviously it would be awesome to require less sleep to be alert and not lethargic the following day however there is no way to change the required amount of sleep you need. Largely determined by genetics, how much sleep you will need won’t change and regularly changing the amount of time you sleep wont make ur sleep schedule adapt. If you feel your best at 9 hours than that is just the reality. In 2009, Carnegie Mellon University’s Sheldon Cohen found a link between sleep and catching a cold. In the study he screened over 150 adults who underwent health screenings for two months, which included interviews and questionnaires for the baseline in psychological and physical health factors. The researchers tracked their sleep patters for seven days, this included monitoring how long they slept and how well they slept. Afterwards they all met at a common ground were administered the cold virus via nasal drops and were monitor for another week. The researches collected mucus samples and analyzed them. Conclusion: The data showed those who got less that six hours of sleep a night were 4.2 times more likely to catch the cold compared to the other subjects. The study also concluded the lower amount of time from six hours you went down (of sleep) the even more likely you were to catching the cold. These results and a table are confounding the ideal that generally this is how much sleep each age group should have. The amount of sleep an individual should have is a measure of your ability to last through the whole day being alert without having to consume any stimulants. That being said we are all different people and we will all have different sleeping regiments due to our lifestyle. So if the sleep spectrum recommends sleep for 7-9 hours but you only need 6 that is fine, just because you are an ‘outlier’ doesn’t mean you are wrong. Same goes if you need more sleep, these results are only recommended and scientist have also concluded with the results that for an individual it’s between themselves and not necessarily with these results. To yield the best results for yourself it is recommended to spend at least a week forming a sleep schedule where you go to bed at the same time everyday and wake up with no alarm clock and after a while a trend will appear and you will find your optimal sleep schedule. This entry was posted in Uncategorized on October 21, 2016 by Cole Donald Rogers. I can that sleep , or the meaning of it, is a strange thing to try and understand. For me I’m more use to get around 4 to 5 hours max, but have in the past stayed up for approximately 72 hours and was okay after only sleeping a few hours. I found link that discussed that one reason that one reason that we may need sleep is to help consolidate information to better memorize it. Which makes sense as to why some professors will say to make sure that you get plenty of rest before taking a exam. Here is the Link to the that idea , https://sleepfoundation.org/excessivesleepiness/content/why-do-we-need-sleep. This was a great blog to read! I love sleeping but I am an early riser. All of my friends wake up three hours after me on the weekends and I wonder if I am not getting enough sleep. But now from this post I see that they are just oversleeping and I am getting the right amount of sleep, so thanks! Here are some health benefits of sleeping!